Adding the right kind of oil to your Troy-Bilt tiller's engine guards it from damaged parts. Knowing which oil to add depends on the engine model and the air temperature when it's working. Over the years, Troy-Bilt tillers have been equipped with several different brands of engines, so to be sure you're adding the right kind of oil, check the engine's owner's manual. 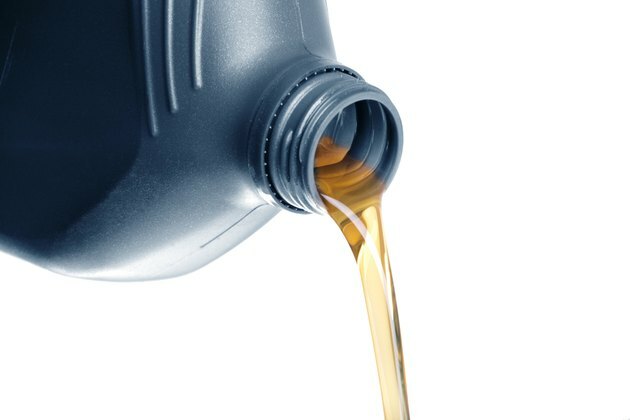 Pouring engine oil out of container on a studio background. What type of oil you put in a Troy-Bilt tiller equipped with a Briggs and Stratton 110000, 120000, 200000 or 210000 series engine depends on what time of year you plan to use it. A high-quality detergent SAE 5W-30 or 10W-30 oil should be used when the air temperature is between zero and 40 degrees Fahrenheit, but use SAE 30 when the temperature is above 40 degrees Fahrenheit. To prevent damaging the engine, use an oil with an American Petroleum Institute rating of SF, SG, SH or SJ listed on the label. If using a synthetic oil, SAE 5W-30 or 10W-30 can be used at any temperature. Two Troy-Bilt models models equipped with 110000 and 120000, 200000 or 210000 series engines are the Bronco and Super Bronco. Models equipped with Honda GX120, GX160 and GX200 engines hold 0.63 quart of oil. When performing general tilling in air temperatures from negative 5 to more than 100 degrees Fahrenheit Honda recommends using a four-stroke automotive detergent oil that is SAE 10W-30 with an API rating of SJ. If you plan to use your tiller for long periods of time when the temperature is above 50 degrees Fahrenheit, use SAE 30 oil. It is heavier than SAE 10W-30 and will reduce wear on internal parts, especially when breaking up heavily compacted soil. If you have a newer four-speed Horse tiller model, it may be equipped with a Honda GX engine. If you've had to replace the engine on your Troy-Bilt tiller and it's a Kohler Courage SH265, keep it running at peak performance at any temperature by filling it with a high-quality SAE 10W-30 oil with a SJ API rating. When you want to get a jump on spring tilling while temperatures are below 40 degrees Fahrenheit use SAE 5W-30. It's a lighter-weight oil that flows when temperatures are cold, providing better lubrication than heavier oils that tend to thicken in cold temperatures. Kohler warns that not changing the oil at recommended intervals can shorten the life of the engine. Horse I and II models sometimes have Courage model engines. Troy-Bilt's Junior model has a smaller 3.5-horsepower Briggs and Stratton engine in either the 91000, 92000 or 94000 series. These models can be run on 5W-30 or 10W-30 synthetic oil at any air temperature. If you prefer a detergent oil use, select one with an API rating of SF, SG, SH or SJ and use 5W-30 or 10W-30 below 40 degrees Fahrenheit and SAE 30 above 40 degrees Fahrenheit. If you plan to operate the tiller all day, check the oil every eight hours. If it has dropped below the "Full" mark, top it all with the same weight of oil in the engine. What Weight of Oil Do You Use in a Craftsman Snowblower? What Kind of Oil Does a Hydro Drive Mower Take?